Foursquare and Yelp have solved local search. Pick a business, especially a bar or restaurant, and you can find just out just about any detail using either app, from tips and photos to recommendations and rewards. But a new start-up, an iOS discovery app called NightOwl, is launching in New York on Thursday to prove there’s room for one more. NightOwl plugs into Foursquare and Yelp to take their most useful info—tips and reviews—and combines it with an algorithm that tells you exactly where you want to go. Cofounder and CEO Kevin Madden calls it the Nightlife Genome Project, a cheeky nod to Pandora’s scientific categorization of songs. 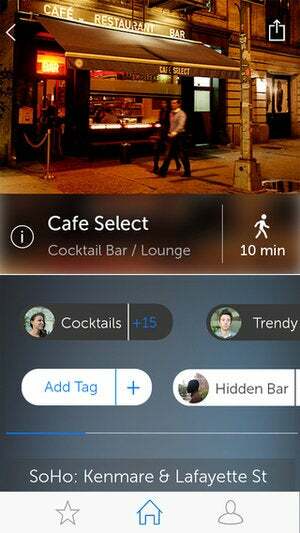 Local search just got even more simple with NightOwl's bar tags. Madden and his team manually seeded the algorithm with information about most of New York City’s major bars and lounges. Once people start using the app, they can tag a place with their own keywords—perhaps “lumbersexual” for a hipster bar in Williamsburg or “bro central” for a downtown club. Those tags will feed the algorithm and help NightOwl recommend new spots for you to try. The app also taps Uber’s API so you can hail a car to your destination. So why use a new app and not an old favorite? NightOwl is an information aggregator at its core, and it’s currently limited to bars in New York. If you want something more detailed, Yelp and Foursquare are still your best bet. But Foursquare’s bewildering decision to cast off its most popular feature, check-ins, leaves the door open for another, simpler app, one that can make an easy decision—where should I drink tonight?—even easier.